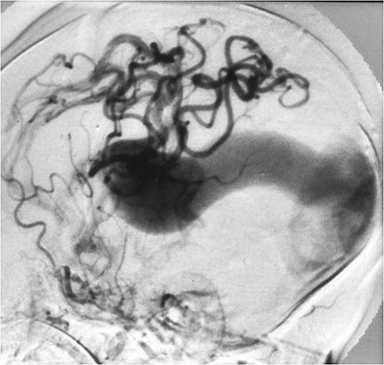 Vascular malformations involving the brain are divided into subgroups, including arteriovenous malformations (AVM), developmental venous anomalies (DVA), cavernous malformations and capillary telangiectasias. These lesions are further categorized into those that demonstrate shunting from arterial to venous systems (i.e. the AVM), and those that do not have shunting (DVA, cavernous malformation, and capillary telangiectasia). In addition, mixed malformations (i.e. 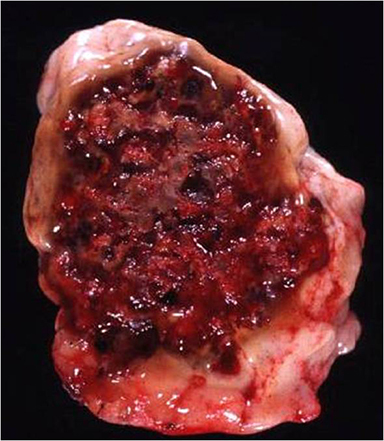 lesions composed of more than one malformation) occasionally occur. The most common lesions seen within a mixed malformation are the DVA in combination with a capillary telangiectasia. Understanding the associated imaging findings and potential complications of these lesions assists in determining the appropriate treatment options. Arteriovenous malformations are high flow shunts between the arterial and venous systems without an intervening capillary bed. These lesions are subdivided into the classic arteriovenous malformation and the arteriovenous fistulas. The peak age for presentation is in the 20 to 40 year old age group (mean age approximately 30 years).3 Fifty percent of these patients present with hemorrhage, and the risk for hemorrhage is 2-4% per year.4,5 Once a hemorrhage occurs, there is a 6- 18% risk of rehemorrhage within the first year.4 This rate gradually returns to 2-4% per year. The mortality rate with the first hemorrhage is approximately 10%. Each successive hemorrhage has an increasing mortality rate, and by the time the patient has their 3rd hemorrhage the mortality rate reaches 20%.6 Twenty-four to 30% of patients present with seizure unrelated to hemorrhage.3,7 Other non-hemorrhage presentations include headache and focal neurologic deficit. In the glomerular form, neural tissue is typically found between the dysplastic vessels of the nidus. (Fig. 3) This tissue is frequently atrophic and gliotic and calcification may be seen. 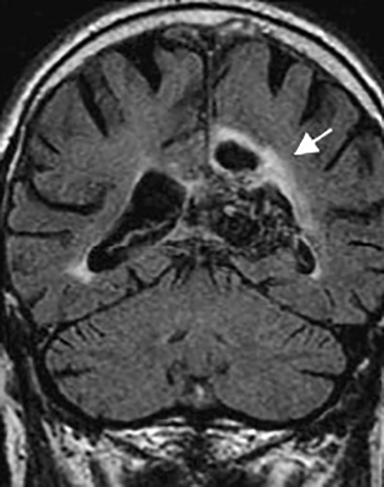 The surrounding brain may develop gliosis resulting from vascular steal related to the AVM. Imaging findings of AVMs vary depending on the size of the lesion, and presence of hemorrhage or calcification. On CT calcification may be seen in up to 30% of cases.13 CT and MR angiography can be utilized to demonstrate the feeding arteries and draining veins. 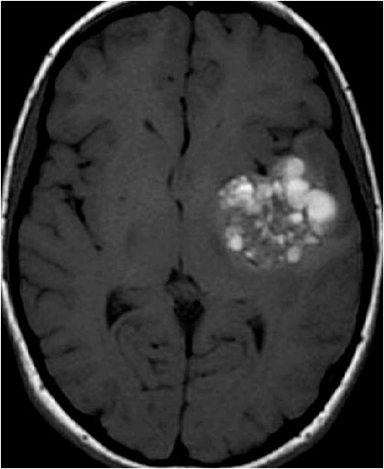 Smaller lesions may be difficult to visualize on non-contrast CT since they are filled with flowing blood that is isoattenuating to slightly hyperattenuating to normal brain. 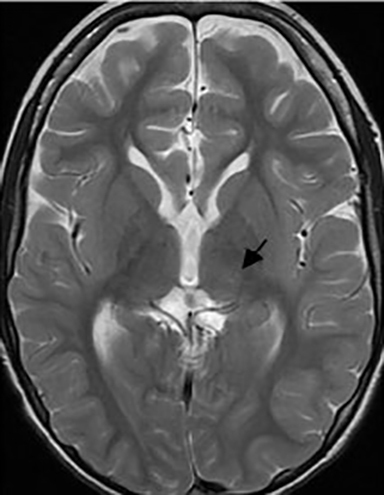 On MRI, flow voids are seen within the lesion, giving the classic “bag of worms” appearance. 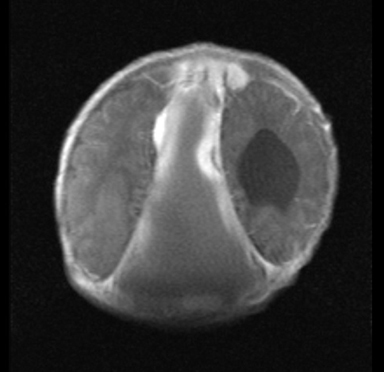 T2* GRE may reveal hypointense blooming if hemorrhage or calcification is present. In some cases, T2 hyperintensity is identified in the adjacent brain parenchyma consistent with areas of gliosis. (Fig. 4) Conventional angiography is still considered the “gold standard” for demonstrating the internal angioarchitecture. The internal carotid, external carotid and vertebral circulation must all be evaluated, since approximately 27% of AVMs have a dual arterial supply.14 Conventional angiography is considered to be the best method to detect intranidal aneurysms. Arteriovenous fistulas are distinguished from AVMs by the presence of a direct, high flow fistula between artery and vein. There is no intervening nidus. These include the dural arteriovenous fistula (dAVF), the cavernous carotid fistula (CCF) and the vein of Galen malformation (VOG). Different classification systems exist for the dAVF, one of which is the Cognard classification. (Table 2) The more cortical drainage present, the greater the risk of hemorrhage. Davies, et al. categorized them as benign or aggressive lesions depending on the presence or absence of retrograde leptomeningeal venous drainage (RLVD).22 In type IV dAVF by the Cognard classification, there is direct cortical drainage and venous ectasia; two-thirds of these cases will have hemorrhage.23 The presence of RLVD on angiography indicates a clinically aggressive lesion and is an indication for active treatment, which may consist of endovascular embolization, surgical resection, or radiosurgery. 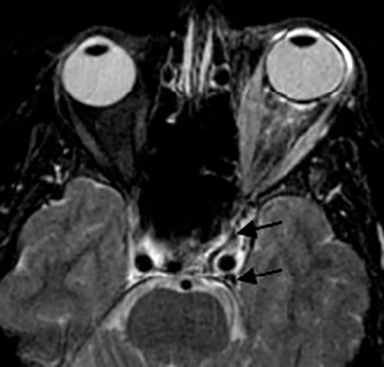 Imaging findings reveal orbital proptosis, enlarged extraocular muscles, dilated superior ophthalmic vein, and enlargement of the cavernous sinus on the involved side. Normally, the walls of the cavernous sinus should always be straight or concave. 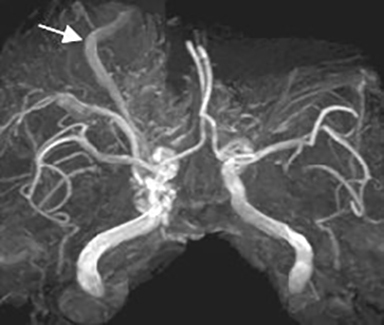 MRI imaging reveals an increase in the number of flow voids within the involved sinus. (Fig. 10) Angiography reveals prompt filling of the superior ophthalmic vein in the arterial phase. (Fig. 11) Conventional angiography may help elucidate the etiology and be utilized for embolization with coils or glue. The vein of Galen malformation (VOGM) is an arteriovenous fistula resulting in dilatation of the median prosencephalic vein (MPV), which is the embryonic precursor to the vein of Galen.26 The exact etiology of the malformation is not known, but the arteriovenous shunts with the MPV are thought to occur during 6 to 11 weeks gestation.26 The resultant increased flow through the MPV prevents the transient fetal venous drainage pattern from involuting. In 50% of these patients, the straight sinus does not form and the vein drains via a falcine sinus. (Fig. 12) These lesions most commonly present in the neonatal period and are the most common cause of non-cardiac congestive heart failure in the newborn period. 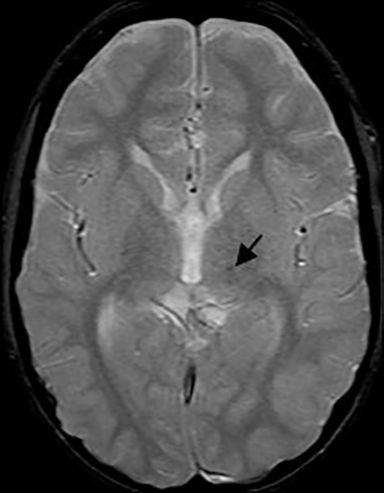 Patients may develop ischemic damage involving the brain parenchyma due to a vascular steal.27 Occasionally, they first present later in infancy and rarely, they can present in adulthood. 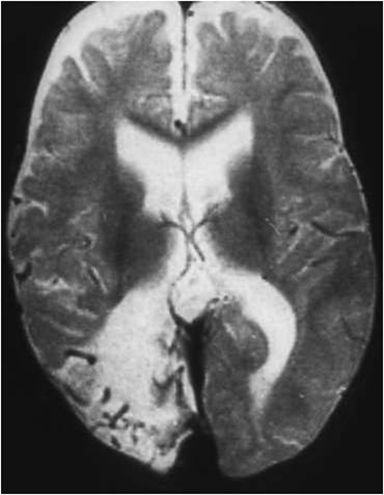 Older infants usually present with milder cardiac symptoms, most often coming to medical attention due to hydrocephalus from compression of the aqueduct or posterior 3rd ventricle. Seizures may also occur.26 Children and adults may present with headaches or subarachnoid hemorrhage. Patients presenting in the neonatal period typically have a worse prognosis than those presenting later. They are more common in males than in females with a ratio of 2:1. VOGM are classified as either choroidal or mural. In the choroidal form, there are multiple feeders from the pericallosal, choroidal, and thalmoperforating arteries resulting in an extensive arterial network between the arterial feeders and the dilated venous pouch. (Fig. 13) In the mural form, there are few feeders from collicular or posterior choroidal arteries that end directly within the wall of the MPV. Over 90% of these lesions are choroidal, and the choroidal form typically presents in neonates. The mural form usually presents in infancy. CT imaging reveals a dilated venous pouch. Mass effect from the dilated vein may result in hydrocephalus due to compression of the aqueduct of Sylvius. 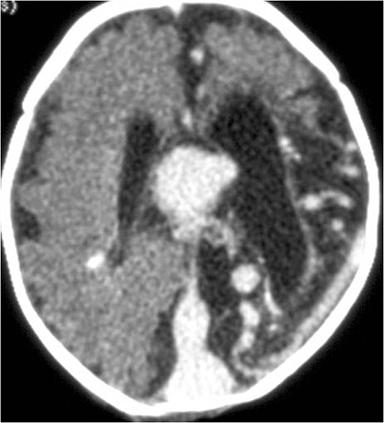 Parenchymal atrophy may be seen due to vascular steal, and calcifications may be seen secondary to ischemic brain damage. (Fig. 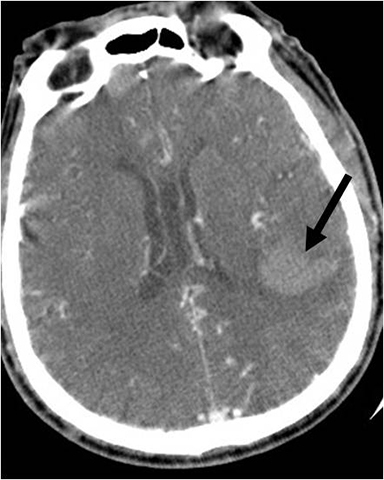 14) Rarely, intraventricular hemorrhage can occur. CT angiography can be utilized to map the arterial and venous structures.28 However, catheter angiography is still the gold standard for the evaluation of VOGM angioarchitecture. On MR, T1 hyperintensity may be seen in the pouch if a thrombus is present. T1 hyperintensity can also be seen in the brain parenchyma in the setting of ischemia or calcification. 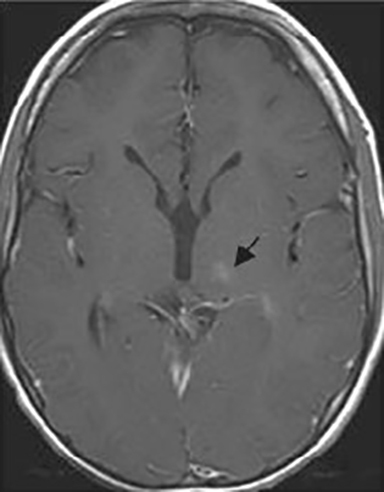 Reduced diffusion may be seen in the setting of acute infarction. 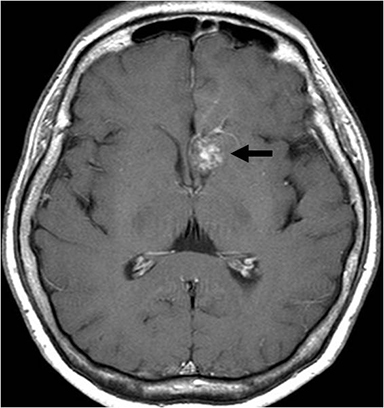 In severe cases, diffuse brain destruction, referred to as melting brain, may be seen. CT imaging is frequently negative, especially if the lesion is less than 1 cm, or in the absence of calcification or hemorrhage.34 Calcification may be seen in up to 60%. On T2-weighted imaging, a peripheral hemosiderin rim may result in a black “halo” around the lesion. (Fig. 16) The adjacent brain parenchyma is normal, and surrounding vasogenic edema is not present unless the lesion is complicated by hemorrhage. (Fig. 17) These lesions may have internal areas of thrombosis or hemorrhage, and these blood products are of varying ages. The presence of methemoglobin results in hyperintensity on T1 images. Findings on post-contrast imaging are variable, with enhancement ranging from none to moderate. It is important to look for a DVA on post contrast imaging, as the location of the DVA will be important if surgical treatment is planned in order to avoid inadvertent damage to venous drainage. DVAs are “leave alone” lesions in that resection will result in venous infarction of the area drained by the DVA. 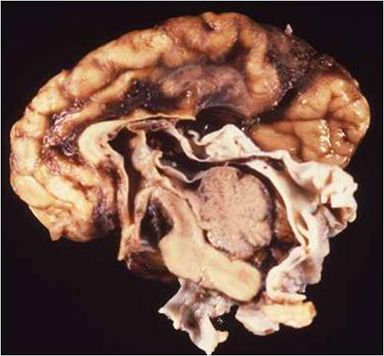 Unfortunately, these lesions may be mistaken for a more aggressive process, such as glial neoplasm. Location, low signal on T2*, enhancement, and lack of mass effect help support the diagnosis of capillary telangiectasia. A study by Finkenzeller, et al. found that these lesions also have a low signal on DWI, and they suggest utilizing this finding to help increase diagnostic accuracy.55 Most are small and are monitored over time. No treatment is required. There are a variety of vascular malformations of the CNS. Some of these are aggressive, high flow lesions and have a risk of hemorrhage or other complications; others behave in a more benign manner. Knowledge of the imaging findings of these lesions, along with the findings that might indicate which ones may hemorrhage or have other associated poor outcomes, aids in making treatment decisions. Geibprasert, S., et al., Radiologic assessment of brain arteriovenous malformations: what clinicians need to know. Radiographics. 30(2): p. 483-501. Matsubara, S., et al., Angiographic and clinical characteristics of patients with cerebral arteriovenous malformations associated with hereditary hemorrhagic telangiectasia. 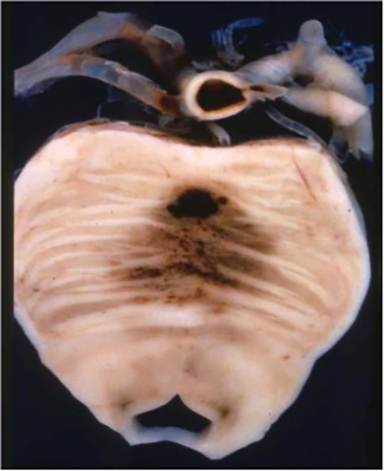 AJNR Am J Neuroradiol, 2000. 21(6): p. 1016-20. Hofmeister, C., et al., Demographic, morphological, and clinical characteristics of 1289 patients with brain arteriovenous malformation. Stroke, 2000. 31(6): p. 1307-10. Al-Shahi, R. and C. Warlow, A systematic review of the frequency and prognosis of arteriovenous malformations of the brain in adults. Brain, 2001. 124(Pt 10): p. 1900-26. 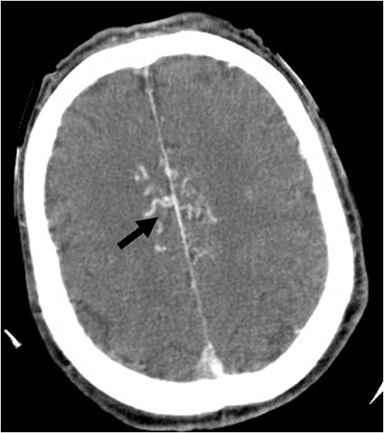 Khaw, A.V., et al., Association of infratentorial brain arteriovenous malformations with hemorrhage at initial presentation. Stroke, 2004. 35(3): p. 660-3. Marks, M.P., et al., Intranidal aneurysms in cerebral arteriovenous malformations: evaluation and endovascular treatment. Radiology, 1992. 183(2): p. 355-60. Weerakkody, R.A., et al., Arteriovenous malformations. Br J Neurosurg, 2009. 23(5): p. 494-8. Mullan, S., et al., Embryological basis of some aspects of cerebral vascular fistulas and malformations. J Neurosurg, 1996. 85(1): p. 1-8. Lasjaunias, P., A revised concept of the congenital nature of cerebral arteriovenous malformations. Interv Neuroradiol, 1997. 3(4): p. 275-81. 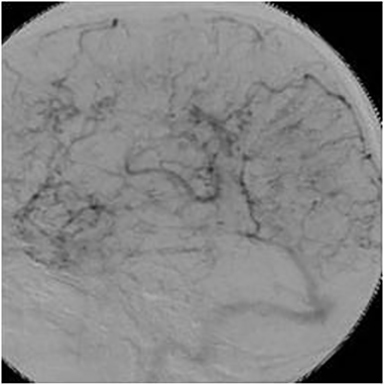 Stevens, J., et al., De novo cerebral arteriovenous malformation: case report and literature review. 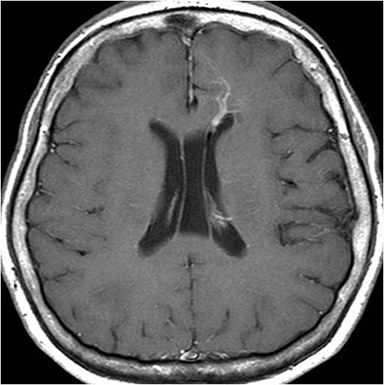 AJNR Am J Neuroradiol, 2009. 30(1): p. 111-2. Davidson, A.S. and M.K. Morgan, The embryologic basis for the anatomy of the cerebral vasculature related to arteriovenous malformations. J Clin Neurosci. 18(4): p. 464-9. Jabbour, M.N., et al., Aberrant angiogenic characteristics of human brain arteriovenous malformation endothelial cells. Neurosurgery, 2009. 64(1): p. 139-46; discussion 146-8. Kiroglu, Y., et al., Intracranial calcifications on CT. Diagn Interv Radiol. 16(4): p. 263-9. Soderman, M., G. Rodesch, and P. Lasjaunias, Transdural blood supply to cerebral arteriovenous malformations adjacent to the dura mater. AJNR Am J Neuroradiol, 2002. 23(8): p. 1295-300. Halim, A.X., et al., Longitudinal risk of intracranial hemorrhage in patients with arteriovenous malformation of the brain within a defined population. Stroke, 2004. 35(7): p. 1697-702. Hamilton, M.G. and R.F. Spetzler, The prospective application of a grading system for arteriovenous malformations. Neurosurgery, 1994. 34(1): p. 2-6; discussion 6-7. Newton, T.H. and S. Cronqvist, Involvement of dural arteries in intracranial arteriovenous malformations. Radiology, 1969. 93(5): p. 1071-8. 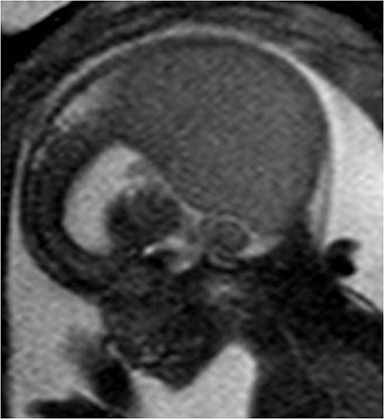 Merzoug, V., et al., Dural sinus malformation (DSM) in fetuses. Diagnostic value of prenatal MRI and follow-up. Eur Radiol, 2008. 18(4): p. 692-9. 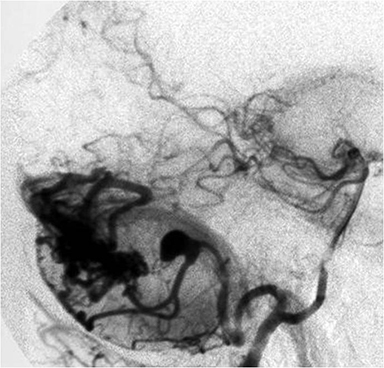 Morales, H., et al., Documented development of a dural arteriovenous fistula in an infant subsequent to sinus thrombosis: case report and review of the literature. Neuroradiology. 52(3): p. 225-9. Hai, J., et al., A dural arteriovenous fistula in cavernous sinus developed from viral meningitis. Acta Neurol Belg. 111(2): p. 146-8. Cohen, S.D., et al., Dural arteriovenous fistula: diagnosis, treatment, and outcomes. Laryngoscope, 2009. 119(2): p. 293-7. Davies, M.A., et al., The natural history and management of intracranial dural arteriovenous fistulae. Part 2: aggressive lesions. Interv Neuroradiol, 1997. 3(4): p. 303-11. 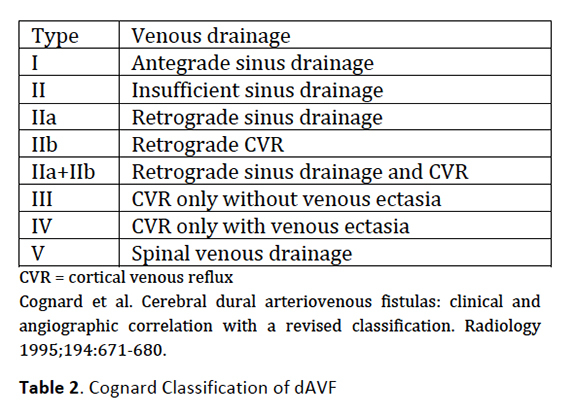 Cognard, C., et al., Cerebral dural arteriovenous fistulas: clinical and angiographic correlation with a revised classification of venous drainage. Radiology, 1995. 194(3): p. 671-80. 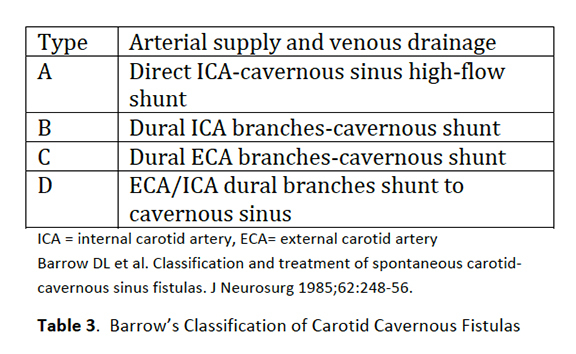 Jacobson, B.E., et al., Traumatic indirect carotid-cavernous fistula: report of two cases. Neurosurgery, 1996. 39(6): p. 1235-7; discussion 1237-8. Kiyosue, H., et al., Treatment of intracranial dural arteriovenous fistulas: current strategies based on location and hemodynamics, and alternative techniques of transcatheter embolization. Radiographics, 2004. 24(6): p. 1637-53. Raybaud, C.A., C.M. Strother, and J.K. Hald, Aneurysms of the vein of Galen: embryonic considerations and anatomical features relating to the pathogenesis of the malformation. Neuroradiology, 1989. 31(2): p. 109-28. Hoang, S., et al., Vein of Galen malformation. Neurosurg Focus, 2009. 27(5): p. E8. Gatscher, S., et al., Multislice spiral computed tomography for pediatric intracranial vascular pathophysiologies. J Neurosurg, 2007. 107(3 Suppl): p. 203-8. Gailloud, P., et al., Diagnosis and management of vein of galen aneurysmal malformations. J Perinatol, 2005. 25(8): p. 542-51. Dowd, C.F., et al., Transfemoral venous embolization of vein of Galen malformations. AJNR Am J Neuroradiol, 1990. 11(4): p. 643-8. Gailloud, P., et al., Confirmation of communication between deep venous drainage and the vein of galen after treatment of a vein of Galen aneurysmal malformation in an infant presenting with severe pulmonary hypertension. 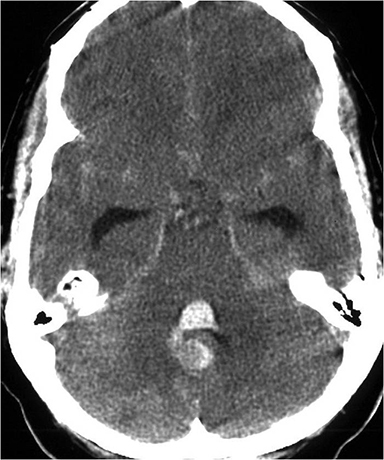 AJNR Am J Neuroradiol, 2006. 27(2): p. 317- 20. 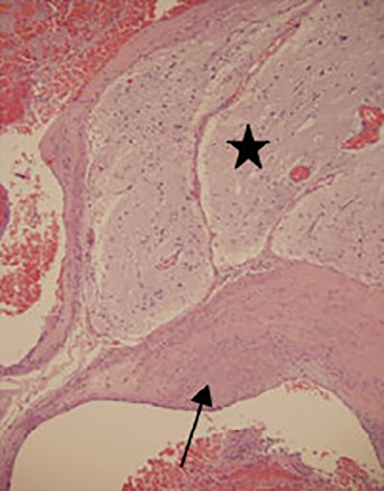 Lasjaunias, P.L., et al., The management of vein of Galen aneurysmal malformations. Neurosurgery, 2006. 59(5 Suppl 3): p. S184- 94; discussion S3-13. Moriarity, J.L., R.E. Clatterbuck, and D. Rigamonti, The natural history of cavernous malformations. Neurosurg Clin N Am, 1999. 10(3): p. 411-7. Batra, S., et al., Cavernous malformations: natural history, diagnosis and treatment. Nat Rev Neurol, 2009. 5(12): p. 659-70. Li, D.Y. and K.J. Whitehead, Evaluating strategies for the treatment of cerebral cavernous malformations. Stroke. 41(10 Suppl): p. S92-4. 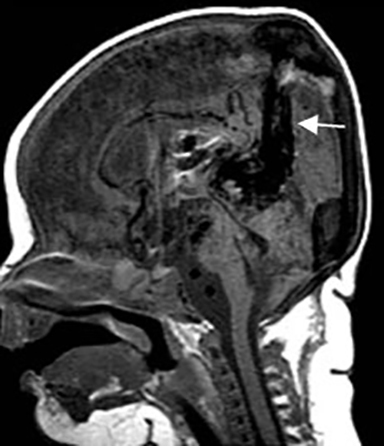 Scott, R.M., et al., Cavernous angiomas of the central nervous system in children. J Neurosurg, 1992. 76(1): p. 38-46. Robinson, J.R., Jr., et al., Factors predisposing to clinical disability in patients with cavernous malformations of the brain. Neurosurgery, 1993. 32(5): p. 730-5; discussion 735-6. Del Curling, O., Jr., et al., An analysis of the natural history of cavernous angiomas. J Neurosurg, 1991. 75(5): p. 702-8. Clatterbuck, R.E., et al., Ultrastructural and immunocytochemical evidence that an incompetent blood-brain barrier is related to the pathophysiology of cavernous malformations. J Neurol Neurosurg Psychiatry, 2001. 71(2): p. 188-92. Ruiz, D.S., H. Yilmaz, and P. Gailloud, Cerebral developmental venous anomalies: current concepts. Ann Neurol, 2009. 66(3): p. 271- 83. Dillon, W.P., Cryptic vascular malformations: controversies in terminology, diagnosis, pathophysiology, and treatment. AJNR Am J Neuroradiol, 1997. 18(10): p. 1839-46. San Millan Ruiz, D. and P. Gailloud, Cerebral developmental venous anomalies. Childs Nerv Syst. 26(10): p. 1395-406. Rothbart, D., et al., Expression of angiogenic factors and structural proteins in central nervous system vascular malformations. Neurosurgery, 1996. 38(5): p. 915-24; discussion 924-5. Kondziolka, D., L.D. Lunsford, and J.R. Kestle, The natural history of cerebral cavernous malformations. J Neurosurg, 1995. 83(5): p. 820-4. Abdulrauf, S.I., M.Y. Kaynar, and I.A. Awad, A comparison of the clinical profile of cavernous malformations with and without associated venous malformations. Neurosurgery, 1999. 44(1): p. 41-6; discussion 46-7. Duffau, H., et al., Early radiologically proven rebleeding from intracranial cavernous angiomas: report of 6 cases and review of the literature. Acta Neurochir (Wien), 1997. 139(10): p. 914-22. Sarwar, M. and W.F. 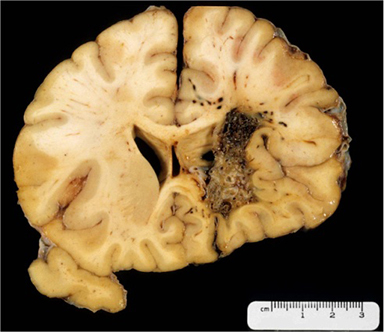 McCormick, Intracerebral venous angioma. Case report and review. Arch Neurol, 1978. 35(5): p. 323-5. 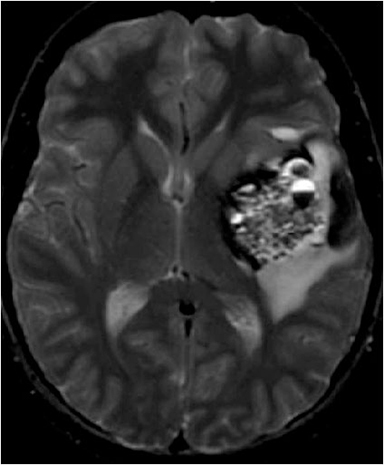 Uchino, A., et al., Double cerebral venous angiomas: MRI. Neuroradiology, 1995. 37(1): p. 25-8. Huber, G., et al., Regional association of developmental venous anomalies with angiographically occult vascular malformations. Eur Radiol, 1996. 6(1): p. 30-7. San Millan Ruiz, D., et al., Parenchymal abnormalities associated with developmental venous anomalies. Neuroradiology, 2007. 49(12): p. 987-95. Sayama, C.M., et al., Capillary telangiectasias: clinical, radiographic, and histopathological features. Clinical article. J Neurosurg. 113(4): p. 709-14. 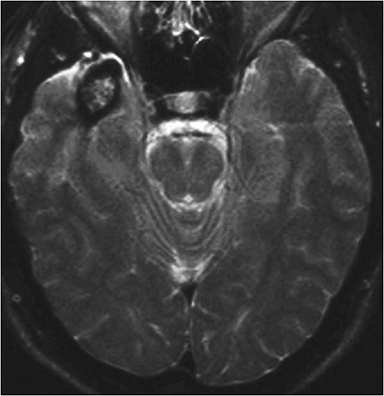 Huddle, D.C., J.C. Chaloupka, and V. Sehgal, Clinically aggressive diffuse capillary telangiectasia of the brain stem: a clinical radiologic- pathologic case study. AJNR Am J Neuroradiol, 1999. 20(9): p. 1674-7. 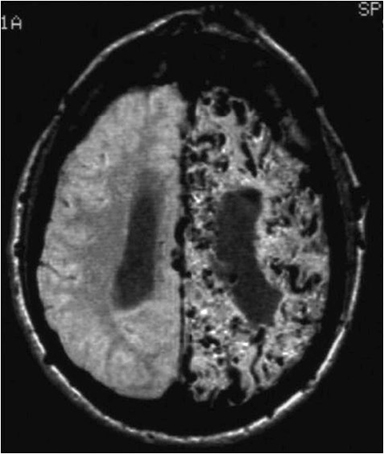 McCormick, P.W., et al., Cerebellar hemorrhage associated with capillary telangiectasia and venous angioma: a case report. Surg Neurol, 1993. 39(6): p. 451-7. Barr, R.M., W.P. Dillon, and C.B. Wilson, Slow-flow vascular malformations of the pons: capillary telangiectasias? AJNR Am J Neuroradiol, 1996. 17(1): p. 71-8. Finkenzeller, T., et al., Capillary telangiectasias of the pons. Does diffusion-weighted MR increase diagnostic accuracy? Eur J Radiol. 74(3): p. e112-6. Smith AB. 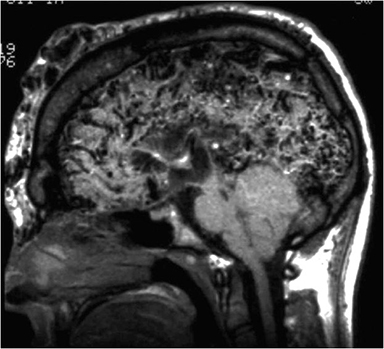 Vascular Malformations of the Brain: Radiologic and Pathologic Correlation. J Am Osteopath Coll Radiol. 2012;1(1):10-22. Dr. Smith works with the Division of Neuroradiology, Uniformed Services University of the Health Sciences, Bethesda, MD.